I’m a huge fan of Apple and iOS. However, lately I’ve become increasingly frustrated with the default apps in iOS 8. This frustration is mainly due to the atrocious syncing between OS X and iOS. I’m definitely not the only one who has noticed the drop in quality. 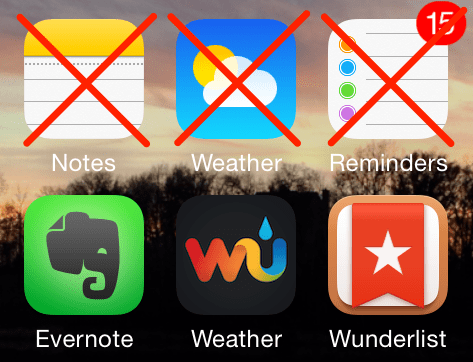 So, if you are feeling the pain as well, here are some great replacements for three core iOS Apps: Notes, Weather and Reminders. Notes is really great if you want to quickly jot something down. However, I can’t tell you how many times I’ve written a note on my Mac only to be unable to find it later on my phone when I really needed it. Replacement: Evernote is a productivity veteran and design award winner. Love: Reliable and fast syncing, completely cross platform, tons of space and great tools for organizing your thoughts. Hate: Evernote regularly adds features, sometimes this feature creep can feel like there is too much going on in the app. In Weather its just too much work to search for the weather in a new location (unless you are already there). Besides, Apple’s iOS 7 weather redesign was basically a less-featured clone of the Apple design award winner Yahoo Weather app. Replacement: Weather Underground is a weather app with 4.5/5.0 stars on the app store. Enough said. Love: Loads of information in a streamlined, clean, readable format. Rejected Alternative: The Weather Channel app has a great name, but let too many animations slow down accessing information. I bought all into reminders two years ago because I could quickly create reminders using Siri. Today I have 100+ reminders spread among a dozen lists. However, I think the cost of leaving this ecosystem is worth it due to the inexcusable bugs in the app with iOS 8: frequently the app will stop syncing with my Mac client for days and often it crashes. Replacement: Wunderlist has a modern, slick interface and syncs quickly between iOS and OSX. Love: Slick UI, completely cross platform, very quick to create tasks, can share lists and ability to assign tasks to people. Hate: Not great at showing me how many expired or due tasks I have and there is no ability to group lists. Fantastical 2 — Great for schedule based tasks and calendar integration. Clear — Cool gesture based UI, but no today list. gTasks — Actually had all the features I wanted, but I’m not a fan of how Google handles user experience. Rejected Alternatives: Evernote, Due, Todolist, ListBox, Any.Do, Taskio, Begin and Producteev.